Inventor Jon Bohmer with the oven he has made out of a cardboard box. 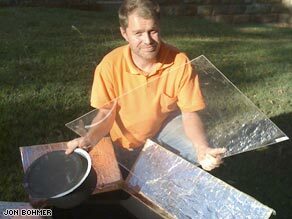 The ingeniously simple design uses two cardboard boxes, one inside the other, and an acrylic cover that lets in the sun's rays and traps them. Can Hong Kong build bigger, higher, greener?